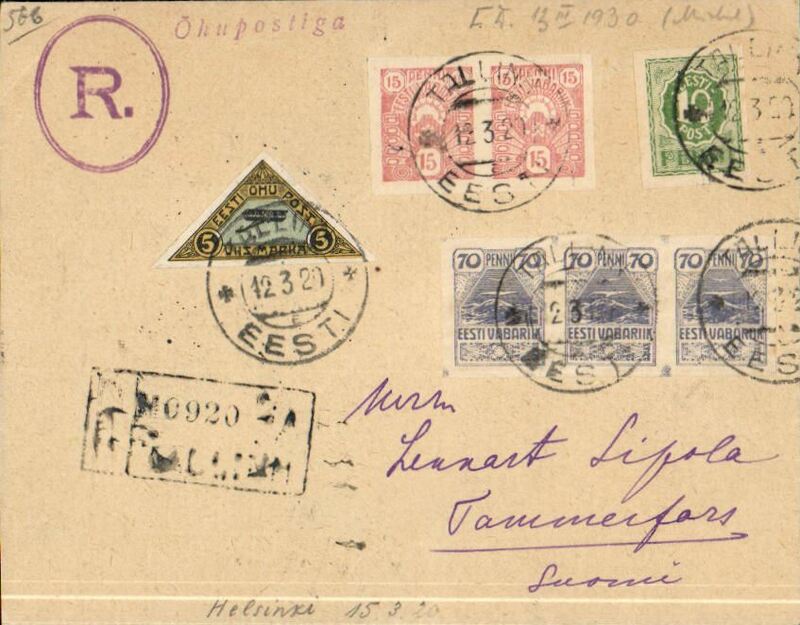 Aero OY (Finnair), F/F Tallin to Helsinki, bs 15/3, registered (hs) cover franked 1919 10p, 15px2, 70p x3 and 1920 air, all canc Tallin/12.3.20/EESTI, 'Ohupostiga (scheduled airmail) hs. Short lived sevice, terminated March 21st, so 'flown covers with Helsingfors arrival mark are rare", See D.Field 1934, p139. 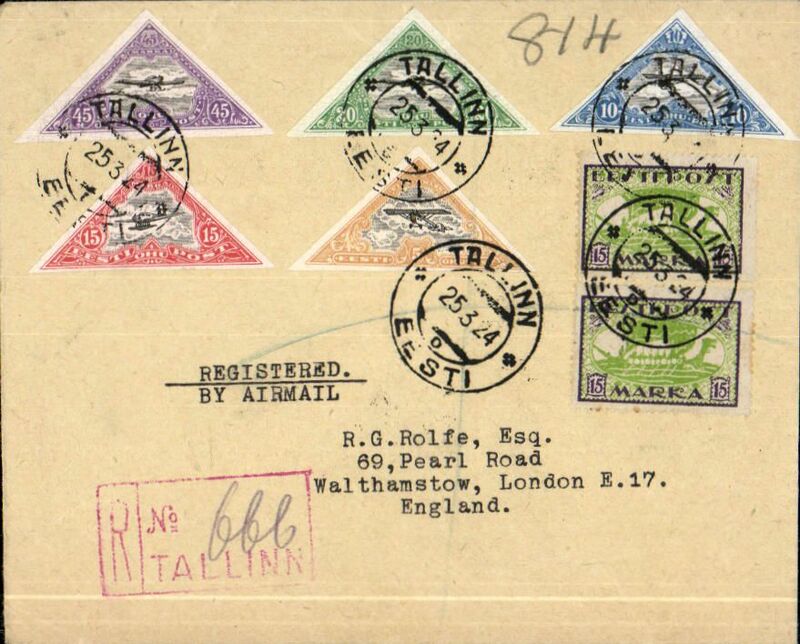 Tallin to England, nice strike red hooded London 29 MR 24 registered arrival ds, registered (hs) cover franked 1924 imperf air set of 5 (cat £27 used) + 15m x2. Likely carried by German airline to Konogsberg, then OAT to England. Nice item. 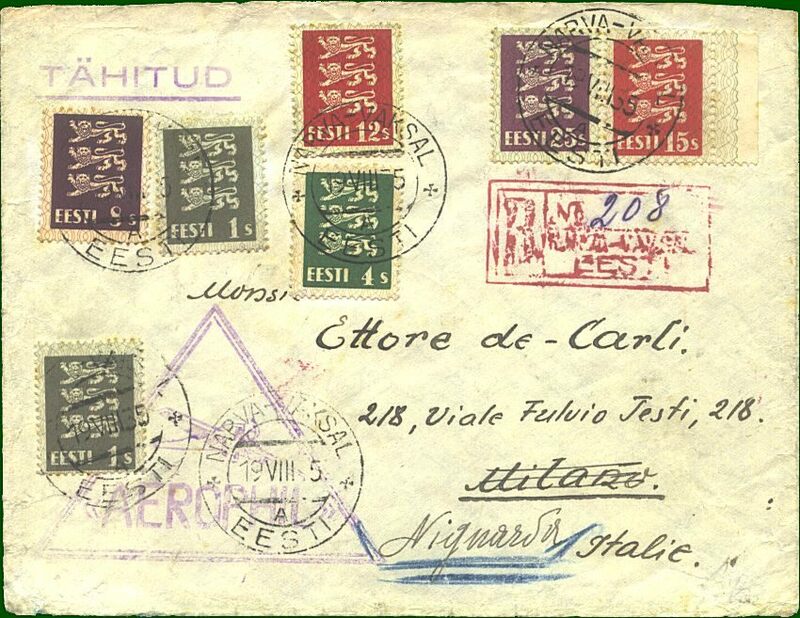 Air cover Estonia-Italy, Narva Vaskal (200km E Tallin) to Milan (2000kmSSW Tallin), bs 22/8, via Brenner Pass, registered (hs) cover franked Arms of Estonia 1sx2, 4s,8s,12s,15s and 25s, large violet triangular plane above 'Aerophil' cachet and green/white 1925 vignette verso. Sender's address has bee excised neatly from flap. A little grubby, but scarce.